The Rapid mass transit bus system is set to unleash the power of the wind. The Grand Rapids agency plans to buy six roof-top wind turbines to help power its expanded operations center and bus garage, which is currently under construction on Wealthy Street SE. The turbines will be located on the west side of the roof and visible from the street, said Rapid spokeswoman Jennifer Kalczuk. Power generated from them will be sent directly to the electric grid and will reduce the agency’s energy costs, she said. “At maximum efficiency, each turbine is estimated to generate one kilowatt per hour,” Kalczuk said. “We don’t know how this will impact our energy costs — because of the expansion, we don’t have hard costs of the new power needs for the facility.” The turbines are part of an effort to make the new building energy efficient and LEED “green building” certified. It also will include natural lighting, a water reclaim system on the bus wash, a snow melt system, solar heating and rain water collection. The $32.4 million, two-year project began in December 2009 and will renovate the current facility at 333 Wealthy St. SE, increasing it from 117,500 to 205,000 square feet. There are currently roof-mounted wind turbines in use at the nearby Kent County Recycling and Education Center at 977 Wealthy St. SW and at the Keller Engineering building at Grand Valley State University’s downtown campus. Kalczuk said what the turbines will look like is unknown as appearance varies by manufacturer. The project is currently on schedule for a December 2011 completion and on budget, she said. The extra space is needed because in recent years The Rapids’ bus fleet has grown to at least 122 buses. The old facility was built in the 1970s and designed hold about 100 buses. When complete, the expanded facility will be able to accommodate up to 170 buses. The new building will also have additional washing an maintenance bays and extra parking. “We are currently working on the underground parking area (for cars), which will hold up the expanded bus storage area,” Kalczuk said. 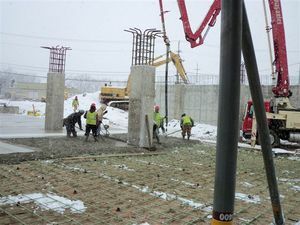 “We are also working on the expanded maintenance bays.” The project is being funded with $28.1 million in federal funds and $4.2 million in money from the state.